Of Abenaki/Huron decent, Suzanne S. Rancourt (Hadley, NY) is a veteran of both the USMC and US Army and continues to serve through the Saratoga County (NY) Veterans Peer to Peer Mentoring program. Her first book, Billboard in the Clouds, Curbstone Press, was the 2001 recipient of the Native Writers First Book Award. Her book, murmurs at the gate, has been selected by Unsolicited Press for publication in late 2018. Ms. Rancourt’s writing has been published, anthologized, and translated extensively: Like Light, Bright Hill Press 25th Anniversary Anthology; Dawnland Voices 2.0 #4; Northern New England Review; Bear Review; Three Drops Press; Snapdragon Journal; Sirsee; Slipstream; Muddy River Poetry Review; Ginosko; Journal of Military Experience; Cimarron Review; Callaloo; and Combat Stress Magazine. 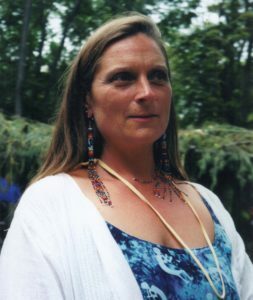 As a presenter and workshop facilitator, Ms. Rancourt’s unique skills have taken her to Lesley University, Cambridge, MA; Songwriting with Soldiers, Princeton University’s Moral Injury and Collective Healing Advanced Training; and to the International Expressive Arts Therapy Annual Conference: Indigenous Roots of Expressive Arts Therapy. Using all of her tools to inform, educate, and alleviate the experiences of trauma, Ms. Rancourt is a multi-model artist.